We sometimes see people referencing or discussing the idea of a person being in service to Fairy or going into Fairy for a set amount of time and then coming back to mortal earth, at least for a while. Often in folklore when this occurs it is for a very precise amount of time and what we most often see is 7 years. This pattern repeats in both folklore and ballads. It's said that the bean feasa and fairy doctors in some instances would be 'taken' for 7 years and then come back to serve the human population. Or, as Yeats puts it: "The most celebrated fairy doctors are sometimes people the fairies loved and carried away, and kept with them for seven years" (Yeats, 1888). Although the text does also clarify that not all fairy doctors are taken in this manner, it is interesting to note that 7 years is specified so exactly for those who are. We also see this number showing up in some of the ballad material as the number of years that a person will be taken to serve in Fairy before being returned to earth. Thro weal or woe, as may chance to be." Thomas is then taken into Fairy and serves the Queen for the required 7 years before being returned to earth with a pair of shoes and new coat - both green* - and the gift of prophecy and true speech. By some folklore accounts she later sent a white hind and stag to guide him back to the Otherworld. In the ballad of 'The Faerie Oak of Corriewater' the Fairy Queen says that the young man she's taken to be her cupbearer will serve her for 7 years. And his wage is a kiss of me." In this instance the person being taken is filling a specific role, although it is also implied that he will also be the Queen's the lover. Unlike True Thomas Elph Irving's payment for his 7 years of service is simply a kiss from the Queen, indicating that what exactly one does in the Otherworld or the reason one is taken has an important impact on how one may be treated and the compensation one receives. 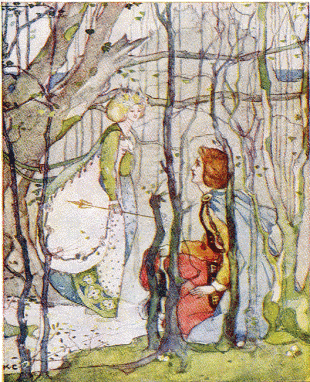 Although it's never explicitly stated in the ballad of Tam Lin, and there is much debate about how long Tam Lin has been in Fairy and how old he was when he was taken, it may possibly be argued that he had served the Queen for less than 7 years. When he convinces his pregnant lover, Janet, to free him he tells her that the fairies pay a tithe to Hell every 7 years, that the tithe is due November 1st (within a few days), and that he is afraid that he will be given in payment because he is 'so fair and full of flesh'. While not conclusive the implication is that he may not have been there for the previous tithe, hence his concern that Janet free him before the next one. It is of course also worth noting that here again we do see the number 7 showing up as significant. As with anything relating to Themselves there are other options seen, including being taken permanently or, as sometimes happened with nursing mothers, being taken until the fairy baby was weaned. However 7 years of service seems to be a common contract, and is a number we see repeated in ballads and folklore.